Sad Sack is a comic strip and comic book character created by Sgt. George Baker during World War II. 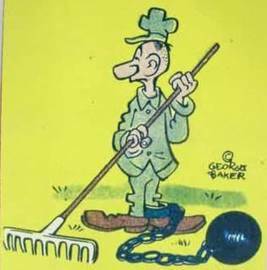 Set in the United States Army, Sad Sack depicted an otherwise unnamed, lowly private experiencing some of the absurdities and humiliations of military life. The title was a euphemistic shortening of the military slang "sad sack of s**t", common during World War II. The phrase has come to mean "an inept person" or "inept soldier". Harvey Comics published original Sad Sack stories in the Sad Sack Comics comic book series, which ran 287 issues, cover-dated September 1949 to October 1982. Harvey also published the one-shot comic The Sad Sack Comes Home in 1951.